Welcome to Chase’s Organic Dairy Farm! We are a family owned and operated organic dairy farm located on the Creasey Ridge Road in Mapleton, Maine. We have about 100 cows in our herd, mostly Red & White Holsteins with a few Jerseys and Black & White Holsteins mixed in. We milk about 60 cows, on average. Our farm was started by Lewis Fraser Chase in 1935 and has been carried on by his two sons, first Donald and then Vaughn. Members of the Chase family have been milking cows here since 1955. The entire family is involved in caring for the land and the cattle. 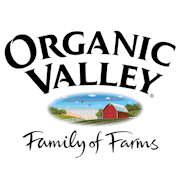 We are proud to be a part of Organic Valley‘s family of farms! We started shipping our milk to them on July 21, 2014. We’re excited about their expansion into Aroostook County and appreciate the opportunity to work with them to help grow organic farming in “The County.” We are very thankful to 27 other Organic Valley farmers in Maine who contributed .25 per hundredweight of milk shipped for one year to help support the hauling cost of the new route. For more information on Organic Valley’s Aroostook Initiative, check out this news article by the Bangor Daily News. In the four years since Organic Valley started coming to Aroostook County, the number of organic dairies has grown from two to twelve! That’s very good news for family farms, local communities, the environment and people everywhere who are looking for pure, nutritious food. Let’s keep that number growing! To help support our farm and other Organic Valley farms, please buy Organic Valley products whenever you shop. Find products near you with their store locator! If you live in Aroostook County, you can buy Organic Valley products at Star City IGA, Hillside IGA and Mars Hill IGA. 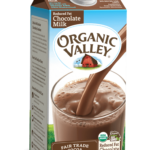 We highly recommend Organic Valley chocolate milk! In the meantime, be sure to check out our facebook page for photos of day-to-day activities on our family farm.